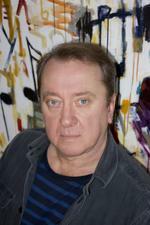 Michael Smetanin is one of the most distinctive figures among Australian composers. Born in 1958 in Sydney of Russian parents he completed his Bachelor of Music in Composition at the New South Wales Conservatorium of Music in 1981, winning several young composers' prizes, including the Frank Hutchens Scholarship, in three successive years. In 1982, having been awarded an International Fellowship by the Music Board of the Australia Council, Smetanin went to study with leading Dutch Composer Louis Andriessen at the Royal Conservatorium in the Hague. Further awards from the Netherlands Ministry of Education and Science, and the Amsterdam Foundation for Arts Funds enabled him to spend two and a half years studying with Andriessen until December 1984. While studying in Holland, Smetanin composed his first major work, Track (for 12 musicians), in collaboration with the ensemble 'hoketus'. In 1984 he wrote The Ladder of Escape for Harry Sparnaay's 'Het Basklarienetten Kollektief'. This work was premiered at the 1984 Salzburg Aspekte Festival in Austria and has since received many performances all over the world. It has been recorded by Sparnaay (Attacca CD Babel 8945-1DDD) and its title was appropriated for a entire series of new music CDs issued by Attacca. During this period his music both crystallised and diversified - the initial minimalist influences of his work, already sharpened and refined by his contact with Andriessen were partly supplanted by a more abrasive hyper-energetic style. This time has also led Smetanin to diversify his concert music interests to include the theatre. His most significant work in the theatre area other than his operas is the composition of the music for the epic eight-hour play The Ecstatic Bible by English playwrite Howard Barker which was premiered at the 2000 Adelaide Festival. Significant professional appointments during this time attest to the high regard in which his work is held both in Australia and overseas. He was a member of the international jury for the 1999 International Gaudeamus Music Week in Amsterdam, a guest teacher at the 5th International Young Composers Meeting (1999) at Apeldoorn in Holland and the principal instructor for the Australian Composers' Orchestral Forum, held jointly by the Australian Music Centre and Symphony Australia, for a number of years. Since 1997 Smetanin has taught at the Sydney Conservatorium of Music where he is now Chair of Composition. In 1993 the internationally acclaimed Elision ensemble presented the first concert program devoted entirely to Smetanin's music, including the premiere of the large-scale song cycle The Skinless Kiss of Angels for soprano, baritone and 15 musicians. The works presented at this concert were subsequently recorded for compact disc by Elision, released on ABC Classics (ABC 446 625-2) in May 1995. Many other works by Smetanin have been recorded for CD release and can be found as individual tracks on over 20 other albums. In 2000, the German radio station Radio Bremen staged a portrait concert devoted to Smetanin's music with the Belgian ensemble Ictus performing the music. Smetanin's largest works are the chamber operas The Burrow, Gauguin and the recently composed Mayakovsky, each with libretti by Alison Croggon, a Melbourne-based writer and poet. The Burrow is a 'psychological profile' of Franz Kafka during his last minutes of life. It created a sensation when it was premiered at the 1994 Perth Festival, with Lyndon Terracini as Kafka; it received a Sydney season shortly after and a new production by Chamber Made Opera in Melbourne in 1995. Gauguin was first produced at the 2000 Melbourne Festival, including extensive use of electronic music and digital animation, and also received wide critical acclaim. Smetanin's more recent major works include Mysterium Cosmographicum (2004-5) commissioned by the Sydney Symphony Orchestra with Lisa Moore as piano soloist and conducted by Reinbert de Leeuw, Microgrphia (2007) commissioned by the Schoenberg Ensemble (Holland) and Shatter (2008) commissioned by Crash Ensemble (Ireland). He has recently completed a long period of work on his third opera Mayakovsky. Mysterium cosmographicum : piano with orchestra (2005) Commissioned by Symphony Australia. Chromium yellow (duos: oboe, harp with pre-recorded sound) (1996) Commissioned by Stephen Robinson. Shakhmat supremat (flute with string orchestra) (1995) Commissioned by Australian Chamber Orchestra. Burrow : opera (1993) The libretto was commissioned jointly by the Song Company and the Nova Ensemble and the music was composed on an Australia Council Composers Fellowship. Strip : string orchestra (1991) Commissioned by Australian Chamber Orchestra. Stroke (solo piano) (1988) Commissioned by Lisa Moore. Book: Black snow by Michael Smetanin : an analysis, and original compositions / Jennifer G. O'Connor. Book: Michael Smetanin : a voice for Australian composition towards the twenty-first century / by Ryan James Daniel. Book: An investigation into correlations between the poster design 'Red lightning' by Ignaty Nivinsky, and the eponymous string quartet by Michael Smetanin / Matthew John Hindson. Book: New dimensions in percussion : 'Black snow' by Michael Smetanin / by Struan Smith. Book: Strange attractions? : rock music, minimalism and modernism in the chamber music of Michael Smetanin / Lindsay Both. Book: Stretching the boundaries of listening : changing microtonal aesthetics in the late twentieth century / Peter McNamara.